More than a decade before the Constitutional Convention in 1787—and months before the United States declared independence—John Adams wrote a plan for a new form of government for the American colonies. In it Adams described the basic structure of what would become American government, including the separation of powers. "A Legislative, an Executive and a judicial Power, comprehend the whole of what is meant and understood by Government." The ideas presented in this letter had a profound influence on the state constitutions of Virginia, New York, Massachusetts, and ultimately, the federal Constitution as the delegates created the "wisest and happiest government that human wisdom can contrive." On the evening of November 14, 1775, Richard Henry Lee, a Virginia delegate to the Continental Congress, had visited Adams in Philadelphia. Their meeting turned to a discussion of "what form of government is more readily and easily adopted by a colony upon a sudden emergency." Impressed with Adams’s recommendations, Lee requested this written version of the plan, which Adams wrote the next day. Lee then distributed the contents in order to convince Virginians to split from the British Empire. On June 7, 1776, on instruction from the Virginia Convention, Lee submitted a resolution for independence, or Lee’s Resolution, to the Continental Congress. Congress approved the resolution on July 2, 1776. The Course of Events, naturally turns the Thoughts of Gentlemen to the Subjects of Legislation and Jurisprudence, and it is a curious Problem what Form of Government, is most readily & easily adopted by a Colony, upon a Sudden Emergency. Nature and Experience have already pointed out the Solution of this Problem, in the Choice of Conventions and Committees of Safety. Nothing is wanting in Addition to these to make a compleat Government, but the Appointment of Magistrates for the due Administration of Justice. taking Nature and Experience for my Guide I have made the following Sketch, which may be varied in any one particular an infinite Number of Ways, So as to accommodate it to the different Genius, Temper, Principles and even Prejudices of different People. A Legislative, an Executive and a judicial Power, comprehend the whole of what is meant and understood by Government. It is by ballancing each of these Powers against the other two, that the Effort in human nature towards Tyranny can alone be checked and restrained and any degree of Freedom preserved in the Constitution. 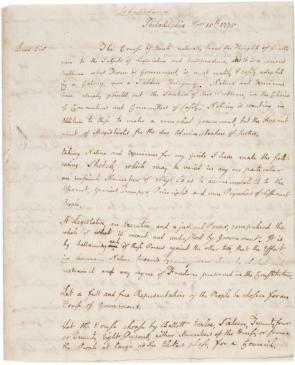 Describe the background, reputation, and influence of John Adams and Richard Henry Lee as of the date of this letter, November 15, 1775. What was Adams referring to when he wrote about “The Course of Events” and a “Sudden Emergency”? How did Adams suggest that the development of a tyrannical government could be prevented? To what extent did Adams believe that “human nature” may play a positive or negative role in the formation of government? Identify the recommendations of Adams that were eventually incorporated into the national Constitution.